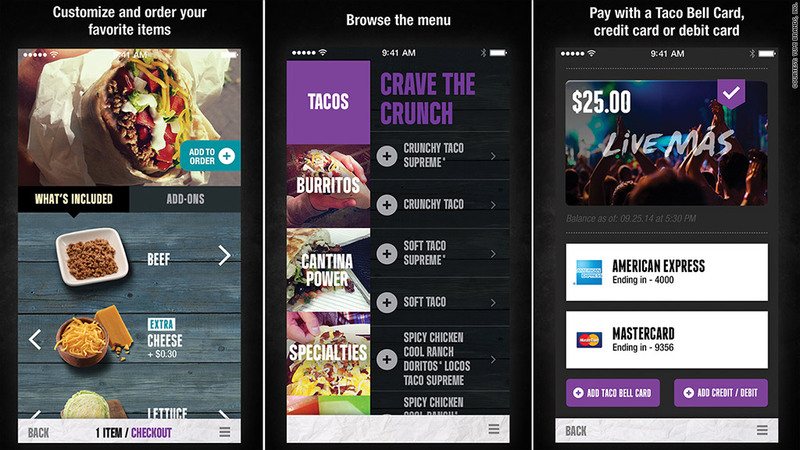 Taco Bell is the latest company to jump into the app craze. Taco Bell unveiled a new app Tuesday that allows customers anywhere in the country to place their orders using their iPhones and Androids. They still have to go the restaurant to pick up their Doritos Locos in person. "You get to skip the line," said Jeff Jenkins, director of mobile experience at Taco Bell, which is owned by Yum! Brands (YUM). But he said there's no feature to select a pickup time because the food won't be prepared until the customer arrives. So what's the point of using the app? Jenkins said both restaurant and customer will both get a heads up from the app once you get close to the Taco Bell. "When you get within 500 feet of the location, you get a notification on your phone that says, 'Looks like you've arrived. Would you like us to start preparing your food?'" he said. Taco Bell is also promoting the fact that app-ordering customers can customize their orders, by adding or omitting ingredients. Taco Bell's move comes close in the heels of Starbucks (SBUX), which announced its app earlier this month. The Starbucks app, which will debut in Portland later this year and go nationwide in 2015, allows customers to place their coffee orders via iPhone. Other fast food companies have apps, though they don't necessarily allow customers to place orders via smartphone. McDonald's (MCD) has the McD App, which is primarily for learning about special offers and locating restaurants. Wendy's has an app that allows customers to pay for meals via smartphone, but they have to go to the restaurant to do it. Customers deposit money into their phone's Wendy's account for that purpose. The maximum balance is $100, which buys about 20 Baconators, depending on the location.